There’s a feeling of exuberance around for you today especially when it comes to your love life. With Venus and Jupiter conjunct it is certainly the time to let your hair down and play! Although the feelings and emotions you feel today may be somewhat like dancing in water as the two figures in this card suggest. It also shows that the current of emotions swirling around you both are in sync and you are in this together versus being opposed or coming from different directions. You never know where the feeling or mood will take you but one thing is certain you will only have eyes for each other and it is a day to forget any petty nonsense of the past which may have been coming between you. 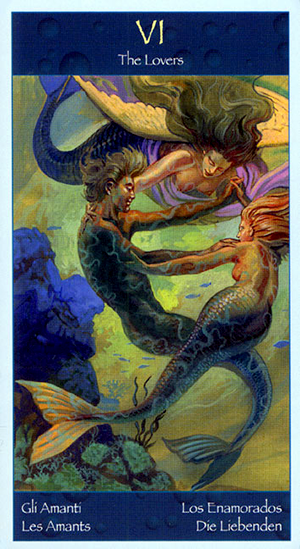 The Lovers in this card are portrayed by a pair of mermaids coming together in a loving embrace. The angelic figure above holds them together as if there is divine intervention looking out over your shoulder just now and a reunion is in order that you may not have seen coming. As you find yourself caught up in the heady emotions of joy, love and togetherness you might wish to spare a thought for how things could be like this if you only let go of anything from your past that sometimes holds you back. The patterns throughout the bodies suggest that whatever you and your partner have been through it has shaped you both in a similar way whilst at the same time holds you both together. When you look at your partner it may truly be you are looking into the mirror and finding a reflection of yourself and your own emotions. Enjoy today because Venus conjunct Jupiter doesn’t come around too often! Today’s tarotscope — The Lovers — features the Tarot of Mermaids by Mauro De Luca and Pietro Alligo. Mauro De Luca is a prolific painter who also gave us Tarot of the Nymph, Pagan Tarot, Leonardo Tarot and Tarot of Sexual Magic..
Pietro Alligo has authored several tarot related books, including Tarot of the Renaissance, Tarot of the Journey To The Orient and Nerfetari’s Tarot.